Fiji Live is reporting that companies in Fiji have been told to hire people based on merit and not diversification, by the Attorney-General, Aiyaz Sayed-Khaiyum. Speaking at a corporate governance workshop in Suva yesterday, Sayed-Khaiyum said when the best candidates are selected, the rest of the requirements will fall into place. He is quoted as saying: “Diversification is mostly assumed to be based on ethnicity and unfortunately in Fiji, there is an obsession with ethnicity." Sayed-Khaiyum, who also holds the Public Enterprise portfolio, said there was a need to be firm in implementing policies so that once the best candidates are chosen based on merit, other factors like their minority group and gender can be considered. Former High Court judge Nazhat Shameem, who facilitated the workshop organised by the Ministry of Trades and Industry for statutory bodies, said it is the ethically-run businesses that prosper. “Reports have supported that an ethical business is more beneficial and has a sustained profit,” Shameem said. What would Shamimi know about Ethics ? with her and Sayed running the show, it's like the blind leading the blind. So the old saying is true then, " birds of a feather, flock together " ! Good corporate governance starts at "home". Khaiyum and Shameem should go and talk about this subject at Government Cabinet level so that they hire people with qualifications rather than military personnel. They can stuff their fancy speeches and go and drown in a lake! Corporate governance my backside - merly a diversion - this (coup)is all about a small greedy cliques grab for power (money). I am glad someone is teaching and talking governance . People in fiji lacks it big time ! !so the more we talk and create awareness the better it is for Fiji. AG should live it to demonstrate it . Someone who attended the workshop told me that Judge Shameem really did a good job of demonstrating governance and was very well meaninged. So well done Shameem. Shameen's understanding about good governance is on par with failed terrorists AG's knowledge of bombs. Yeah Shameem demonstrated good governance joining the coupsters to abuse human rights of the Fijian populace. Some good governance. Talk is cheap. 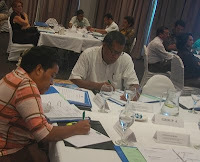 I think creating awareness and teaching governance is good for Fijiand its people . if people dont follow it then its another matter . goverance is goverance like it or not the key is to uphold it and practise it . so well done all those who teach it .